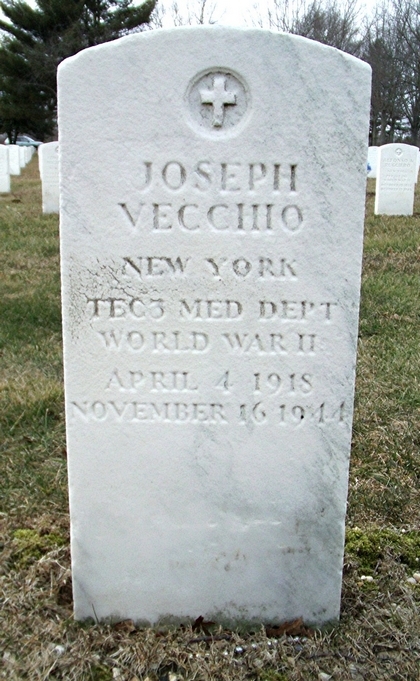 Joseph Vecchio, son of Anthony and Sadie Vecchio, was born on April 4, 1918 in Astoria, a neighborhood in the northwestern corner of Queens on Long Island, New York. He began his professional baseball career when he signed with the Opelousas Indians of the Class D Evangeline League on April 15, 1939. He was released by the club two weeks later but signed with the Abbeville A’s of the same league on May 3. The 21-year-old outfielder batted .140 in 13 games before being released by the A's. Vecchio joined the Army in May 1941 and trained for 16 months with the Fourth Armored Division at Pine Camp, near Great Bend in northwest New York state. During that time he played baseball with the Watertown Collegians, a powerhouse team of college stars coached by future American Baseball Coaches Association inductee Hank Hodge. From the deep snow of the Canadian border, the Fourth Armored joined the Tennessee maneuvers in the Cumberland Mountains, before moving, in mid-November 1942, to the vast California Desert Training Center. Six months later the division arrived at Camp Bowie, Texas, and on September 25, 1943, Vecchio married Rita Campese of Utica, New York. The Fourth Armored left the United States for overseas duty in December 1943 and arrived in England in the New Year. After training until July 1944, the division landed at Utah Beach in France on July 11 and entered combat six days later. Serving with the 10th Armored Infantry Battalion as a medic, Technician Third Grade Vecchio was wounded on August 1 as the division helped secure the Brittany Peninsula. He was hit in the ear and knee while helping to evacuate wounded men from the front lines. In a letter home, he wrote that at one time during the engagement he was only 25 yards from a German machine-gunner, who warned the medic to advance no further. Vecchio was awarded the Silver Star for gallantry in action and the Purple Heart for wounds received. In August 1944, the 4th Armored Division moved swiftly across France as part of General Patton’s Third Army, defeating several large German armored forces in the Lorraine area. On November 16, 1944, as the division advanced through the French town of Dieuze and approached the Saar River, Joe Vecchio was killed in action. He was 26 years old. In December 1948, Joe Vecchio's body was returned from Europe to Utica, New York, aboard the U.S. Army transport ship Barney Kirschbaum. He now rests at Long Island National Cemetery in Farmingdale, New York.